Mt. Sterling's summit is home to a historic fire tower that offers breathtaking views of the Great Smoky Mountains National Park. A scenic, 5 mile round-trip, trail leads hikers through lush forestry from the trailhead to the summit. Mt. Sterling towers above the Pigeon River Gorge on the northern end of the Great Smoky Mountains National Park. Sterling is a mountain steeped in history and covered in an elegant mix of hardwood and evergreen forestry. The mountain was mistakenly named after a 2’ streak of Lead that crosses the Pigeon River on the Northern foot of the mighty mountain. Prospectors flocked in search of silver that was never found. Nowadays, visitors still come in search of metal, in the form of the east coast’s highest remaining fire tower. On Sterling’s 5,842’ summit stands a rickety, and rusted, 60’ tower which peaks above the surrounding forestry to give brave onlookers a sprawling view of the surrounding beauties of Southern Appalachia. In terms of a view, the one achieved from braving the harrowing, and narrowing, steps of the Mt. Sterling fire tower is unparalleled. Once you have braved the climb and adjusted to the undulations of the swaying old fire tower you can enjoy panoramic vistas in all directions. From the Mt. Sterling Gap Trailhead, hikers begin their journey on the aptly named Mt. Sterling Trail. For 2.3 miles the trail winds upwards (2,000’) along Sterling’s flanks through old-growth Fir forests lined with fascinating flora. Once hikers have completed this section of trail the path turns to the right and gently follows the ridgeline of Mt. Sterling for another .4 miles to its summit. The summit is home to a fragrant evergreen forest and backcountry campsite #38. Water can be found roughly .2 miles past the summit down the well-signed Baxter Creek Trail. Although beautiful, the summit itself does not offer any long-range views. View seekers must make their way up the tower to obtain a scenic perspective! Adventurous hikers who desire a memorable view are really going to find what they are looking for on this mountain. 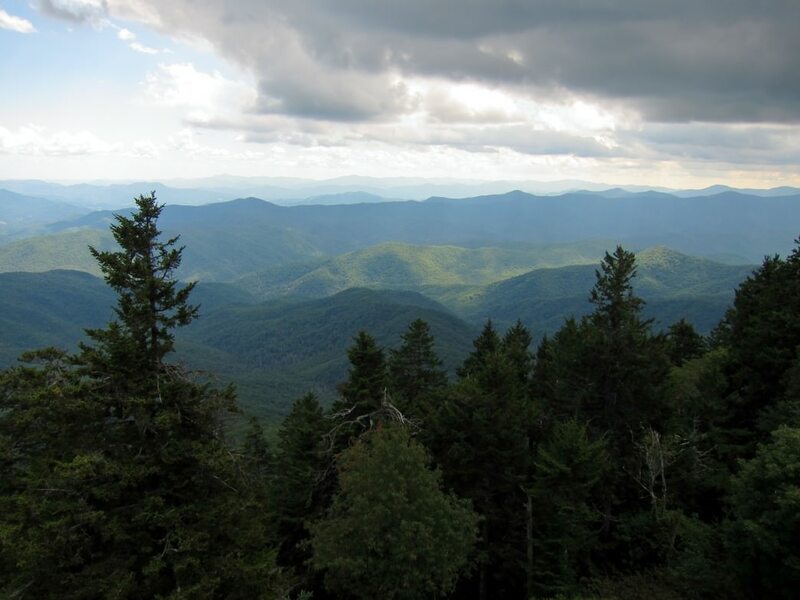 The tower provides some incredible photo-ops and an almost unimaginably expansive view of the National Park as well as the Pisgah and Cherokee National Forests. If you enjoy the pungent aroma of evergreens then the forests of Mt. Sterling are the perfect place to come stimulate your sense of smell. Hikers looking for a more strenuous day can take the Baxter Creek trail for a strenuous 6.2 mile approach to Sterling’s summit from the Big Creek Campground area. From Asheville take I-40 west to the NC/TN state line and take the Waterville exit (451). Turn left and cross the bridge onto Waterville Rd. After 2 miles you will come to a 4-way intersection. Take a left onto Mt. Sterling Rd and continue for 6.7 miles on the gravel road until reaching the sign for Mt. Sterling Gap. If you are up for a scenic drive after your hike continue in the same direction on The Old Cataloochee Turnpike into Cataloochee Valley to view historic sites and famous wildlife! Well marked signs will help you return from Cataloochee Valley to I-40. No fees or permits are required for a day hike to Mt. Sterling but you must register ahead of time for a spot at backcountry campsite #38.